Scott is a recent addition to the Sparkgeo team. Prior to joining us, he implemented management information systems in the software industry. He has also worked in the financial industry for a major financial institution, as a mortgage broker, and in sales and implementation of business management software. An alumnus of UNBC’s Marketing program, Scott expanded his learning with training in Accounting, Project Management, and Financial Planning. Scott has a wild imagination, and an appetite for learning about diverse subjects. 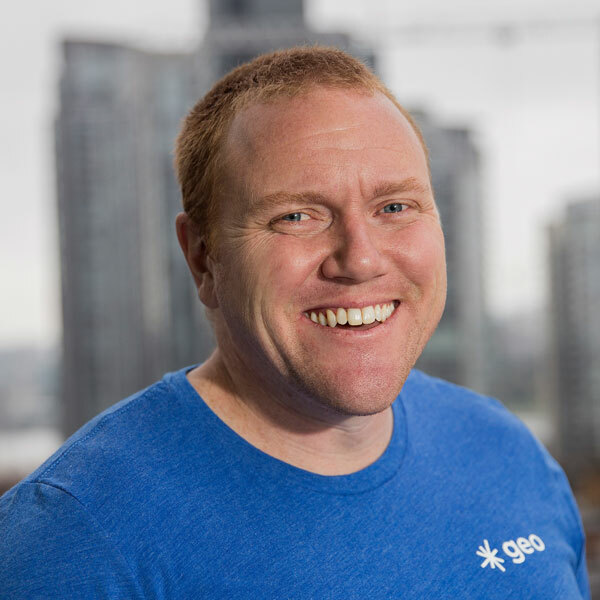 Scott joined Sparkgeo for the opportunity to expand his knowledge in a growing industry. He also appreciates the opportunity to collaborate with new colleagues, prospects, and vendors. That said, he’s (literally) closest to his faithful companion: Ruby (a Border Collie, Red Healer cross). Scott likes any work that involves problem solving and creative thinking. He also values projects that give him the opportunity to learn new skills—and share what he’s learned with others. Scott loves camping, skiing, hiking, mountain biking, and most things he can do outdoors with his dog. He also loves board game nights and karaoke. He’s traveled to England, where he soaked up all the history he could. Most recently, he visited Chicago and Outer Banks (North Carolina). If he could be anywhere right now, he’d go camping.